There are two ways to encode an RFID tag. With an RFID Printer Encoder and with an RFID Reader. Because the RFID Printer Encodes isolates each RFID inlay and shields it from the outside interference, the encoding is reliable. But what if I need to encode the tags on the go, with a fixed reader and in an environment where I have many other RFID devices transmitting? This should not be a problem when the readers deploy Anti-Collision and Dense Reader Mode, which can be quite effective, especially within the US regulatory environment. In addition, US regulations provide 50 500kHz wide channels, so there is a lot of readers that can fit within the spectrum with sufficient spacing, even before the DRM is necessary. However, this is not the case in other places where the RF regulations are more restrictive, such as for instance in Europe under ETSI regulations, where we have effectively only 4 200 kHz wide channels available for reader transmissions, or in China, where there are only 20 channels that are only 250 kHz, and there we can encounter problems. In an area with few available frequency channels and multitude of readers, the RF interference may negatively affect the tag-reader communication and the tag may fail to encode and the write operation will be canceled. To solve this issue, we created a simple application that provides a fixed frequency channels for encoding operations (this can be used only in environments where fixed channel usage is allowed, such as EU* or China). The application enables “Use specified frequency” mode, where it assigns channels or channel pairs to readers with a result of 500 kHz minimum channel spacing between each reader. In addition, each reader uses the minimum required power to encode a tag in order to reduce interference. The reader performs a margin test to determine minimum power required to read a tag and adds 6 dBm to the minimum read power and attempts the tag encoding. If there is insufficient power error during encoding, the transmit power is increased by 1dB and encoding attempted again. This process is continued automatically until the sufficient power level achieved and the tag is encoded. In the application, we created a user interface to get the reader’s IP address and use LLRP port 5084 to connect the reader. The user has to input the frequency channels to be used and the minimum antenna power (dBm) value to start with. After pressing encode, the process starts and continues until the tag is successfully encoded and without interference with other readers present. We connected the reader using SDK command and set read mode as Auto Set Dense Reader mode. We set the Antenna power and Frequency given in the UI. We tried to read the tag using the given minimum power (dBm) setting, which was initially set to 10 dBm, to read the tag. In this case, the reader was not able to read the tag. Therefore, the power was increased by one again. At 11 dBm, the reader was not able to read the tag either. The process was repeated until the reader was able to read the tag using 20 dBm power value. The steps above established that the power value 20 dBm was the stable antenna power for reading the tags by the reader using the specific antenna. Then we set to identify the minimum stable antenna power setting for encoding using the same reader and the antenna. As writing to a tag needs more power, we increased the antenna power by 6 dBm from the read power settings range. With the power setting of (20 + 6) 26 dBm we tried to encode a tag. The tag was not encoded because the power was too low. Based on the retries (Configured in UI) we increased the power by one. Now the value became 27dBm, and the reader was able to encode the tag. This established the stable antenna power for encoding a tag to be 27 dBm. 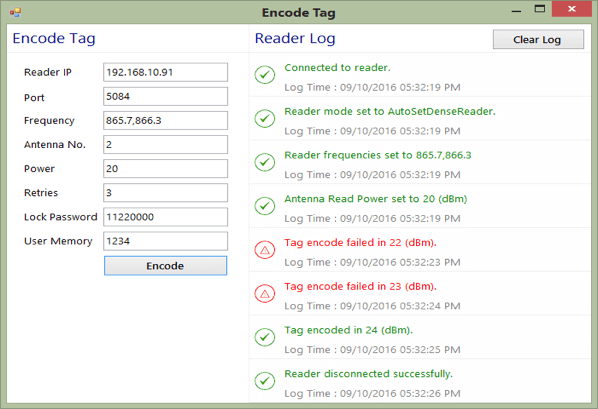 This process has been automated programmatically and the resulting application allows for successful tag encoding within a dense reader environment without RF interference. *Note: Channel usage in EU is allowed with certain time limits. Please see below diagram from ETSI. Therefore, you should not use a single channel but always multiple channels, however, you can select which ones you’d like to use. If you have questions about this application, please contact us!